As a concerned boss, you should be on the lookout for avoidable workplace dangers to keep your employees happy and healthy. From a monetary standpoint, injuries on the job can lead to increased healthcare costs, workers' compensation claims and even lawsuits. In addition, state and federal regulations from the American National Standards Institute (ANSI), National Fire Protection Association (NFPA) and Occupational Safety and Health Administration (OSHA) mandate warning signs for numerous hazardous situations. While workplace safety signs may seem like a simple matter, with all of these factors involved, it's easy to see they are a serious issue. Sign Builder 2.0 is another service of St. Claire, Inc. Create exactly the sign you need with five templates, including designs compliant with ANSI, NFPA and OSHA standards. Pre-designed headers like "Danger" and "Caution" are available in English, Spanish and French. While Sign Builder is free, the company does request PayPal donations to help keep it available to thousands of users. The Dunhill & McGrouther Group sponsors two domains devoted to free caution signs, Freesignage.com and Online-Sign. The company sells computer equipment, printers and sign-making materials. However, it clearly states, "Whether the users of the facility offered by Online-Sign elect to make use of these suppliers is entirely at their option." 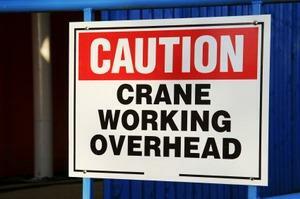 As a UK-based site, it also provides signs designed to European safety standards. Online-Sign provides a more customizable experience, with content choices for each sign and three paper sizes. All signs are downloadable as PDF files. It includes many of the same categories as its sister site, along with free fire safety posters and signs. Unless your company has sophisticated printing and laminating facilities, your warning signs will be printed on plain paper or cardstock. It is your responsibility to make sure these signs comply with all applicable regulations. OSHA, ANSI and NFPA sign standards can be very specific. Even for non-government-mandated signs, in the long run, you may be better off investing in a high-quality vinyl or metal sign. However, for short-term notices or general reminders, a computer-generated sign may be just what your office needs. The viability of printed signs will also depend on your workplace situation and the sign's intended use. A sign to be posted over a laboratory sink doesn't need to be as durable as a sign at a construction site. Use your best judgment in deciding when a free caution sign isn't such a great deal.